Since the 1970s liming has been practised on a large scale in Sweden to mitigate acidification and several thousand lakes and streams are limed repeatedly. The Swedish monitoring program ISELAW (Integrated Studies of the Effects of Liming Acidified Waters) studies the long-term effects of liming. 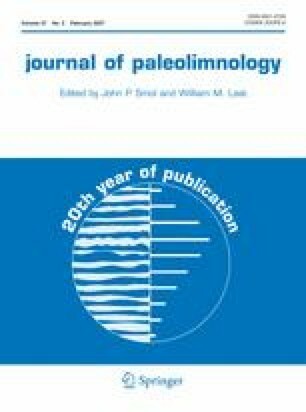 This paper summarizes the paleolimnological part of the program. Sediment cores from 12 lakes were analysed to study the development of the lakes from pre-industrial time until the present, and address questions about natural conditions and the effects of early human impact, acidification, and liming. Diatoms were used to reconstruct the pH history and to study shifts in species composition due to acidification and liming. Analyses of lead and spheroidal carbonaceous particles were applied for indirect dating and as indicators of the atmospheric deposition of pollutants associated with acid rain. Pollen analysis was performed in eight of the lakes to study the vegetation and agricultural history. The natural pH (prior to human disturbance) was between 5.3 and 6.5 in the eight lakes where the complete post-glacial sediment sequence was recovered. Pollen from anthropochores and apophytes indicated early agricultural land use in the vicinity of the lakes from 1000 to 2000 years ago, and pH increased with land use in six of these lakes. Five of the lakes have been acidified during recent decades, and in all 12 lakes some effects of liming were recorded in the diatom assemblage. The lakes show different responses to liming, including a return to a pre-acidification diatom composition or a shift to a state previously not recorded in the lake’s histories. This study accentuates the complexity of biological response to acidification and liming, and highlights the importance of historical perspectives to assess the current state of a lake’s ecosystem and to establish adequate restoration goals. This study was financed by the Swedish Environmental Protection Agency. The lead analysis was provided by Ove Emteryd and Birgitta Olsson at SLU (Umeå) and the pollen analysis by Jan-Erik Wallin, Umeå University. We would like to thank Anna Ek, Veronika Gählman, Tom Korsman, and Peter Rosén for contributions to the diatom and fly ash analyses and Richard Bindler and Gunnar Persson for valuable discussions.